Under 7 Yellows started the game with all eight boys available for the first time this season. Stockton flew out of the traps and were in the lead within two minutes when Fin received the ball on the right touchline, he beat two Hartlepool defenders wth some brilliant footwork and sent a well weighted pass into Archie who made no mistake with a net finish into the bottom left hand corner. Hartlepool then came into the game briefly and a good finish from just outside the box levelled the score and made it one each. This was as good as it got for Hartlepool as a strong Stockton side then took control of the game with Fin causing problems down the right he found Kian unmarked who with a great strike beat the Hartlepool keeper to put Stockton back into the lead. Stockton were now playing some good football and with Owen getting plenty of the ball playing from the back he played the ball into Fin who found the top left hand corner giving the Hartlepool keeper no chance. 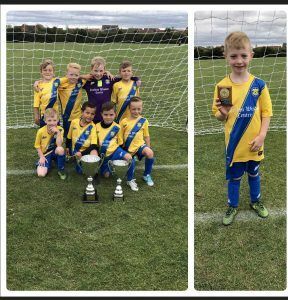 Georgie, Oliver and Thomas then entered the field and made an immediate impact when Oliver and Georgie combined and with a neat finish Georgie made it 4-1 to the yellows. Stockton were now in complete control and effectively ended any hopes of a comeback when Kian picked the ball up from Thomas and gave it to Oliver on the right touchline using his pace and power he beat two Pools defenders and found the top left hand corner from just outside the box to make the score 5-1 at the break. Stockton started the second half the same as the first and were putting the Pools defence under constant pressure and when Kian tried a looping effort from distance, Owen followed in to challenge the keeper and nodded in the yellows sixth. Stockton were now trying to pass the ball from the back with Dylan and Thomas both showing confidence on the ball and not letting anything past them, the yellows kept piling forward with Georgie showing good composure to find Owen unmarked who scored his second of the game to make it 7-1 to the yellows. After his earlier goal and assist, Oliver now grew in confidence and began to show what he can do, receiving the ball from Fin he beat the Blues defender and scored his second of the game. Stockton looked like scoring every time they attacked and with Archie doing plenty of running from the front he unselfishley found Oliver who rounded off the scoring and completed his hat-trick to make it 9-1. All eight boys played there part but with his brilliant hat-trick and high energy display Oliver picks up this weeks Player of the Match. The boys have started the season brilliantly with plenty of goals and most importantly big smiles on all of their faces. With the Yellows now safely into the next round, attention now returns to League action with a home game against Newton Aycliffe on the 30th September.